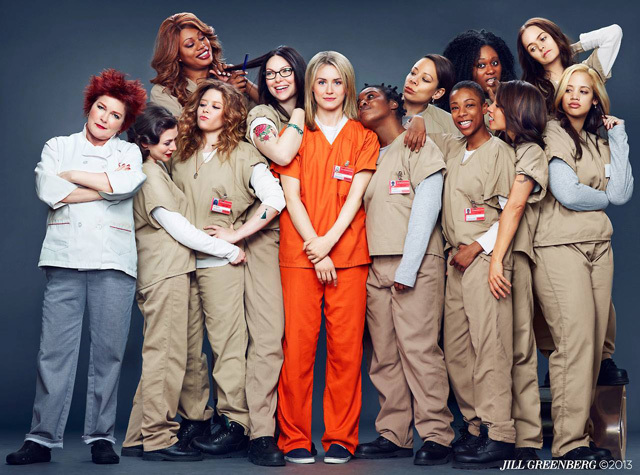 Much has been written about the Netflix original bougie-bi-white-lady-goes-to-prison-for-a-year-dramedy Orange is the New Black (OITNB). Mychal writes about the show’s exploration of trans issueshere. Major smartypants Salamishah Tillet at The Nation looks at the show in the context of violence against women. Kortney Ryan Ziegler talks about its trans black narrative at blac (k) ademic. But I’m not going to discuss the show’s politics. I’m going to discuss the politics of the some the show’s cast members. Putting aside politics for a second (Ew. Did I just say that? ), I have to say I was totally addicted to the show and consumed it quickly, thanks to the uncontrolled access provided by a Netflix series. I like the show about 10 times more than Netflix’s other series House of Cards (where I don’t care at all about the characters, except the one who’s now dead. Thanks, guys.) And though I loved Arrested Development, a show so good it has ruined all other comedy shows on TV for me, the Netflix episodes are disappointing. (For one thing, Jason Bateman’s character has become unbelievable and over the top. What happened to the restrained and hilarious straight-man Michael I used to know and love?) So, I started googling all I could about OITNB and its actors. And now, I kinda wish I hadn’t. Because here’s what I found out. 1. Taylor Schilling (who plays Piper Chapman) was the star of Atlas Shrugged: Part I, a movie based on the book of the same name by conservative-ish libertarian Ayn Rand, who hated taxes, any social safety net, feminism, women’s lib, female presidencies and called herself a male chauvinist. She’s also considered a hero by the TeaParty. Paul Ryan loves Rand, though she would no doubt be disgusted by his religiosity and fervent commitment to a government ban on abortion. OK. So the message of the book and the movie is problematic, to be extremely charitable. What is Schilling’s role here? Besides the lead (pun intended), Schilling is, on some level at least, endorsing the Randian ideology by participating in the film. Or at the very least she is condoning it by staring in a movie which perpetuates Rand’s message. I understand it’s hard for actors to get work. I just don’t like to think of her playing a character from that movie, which, in addition to spouting bad politics, was critically panned on a nearly universal level, so it seems like it was a bad decision all around.